Hello guys, Kim Dellow here and for my contribution to the fabric topic I thought I would make one of my fabric necklaces. I don't often get time to make them so this seemed the perfect excuse to make some time! For my fabric necklace I've used old jeans and calico and some of my own stamps from the PaperArtsy Eclectica³ EKD 01 set. Step One: Iron a piece of Bondaweb to both sides of a piece of calico then iron one side to a piece of stiff craft interface, keep the paper backing on the other side. Use a circle die to cut out a small circle from the stiffened calico and keep the negative to hand too. 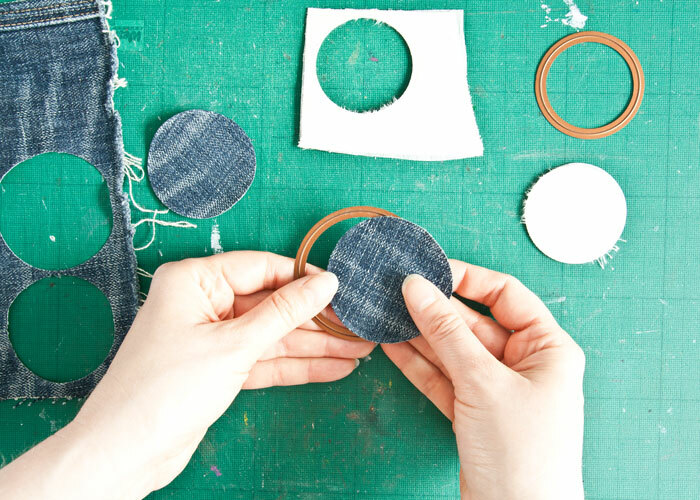 Now cut two larger circles from denim using circle dies. 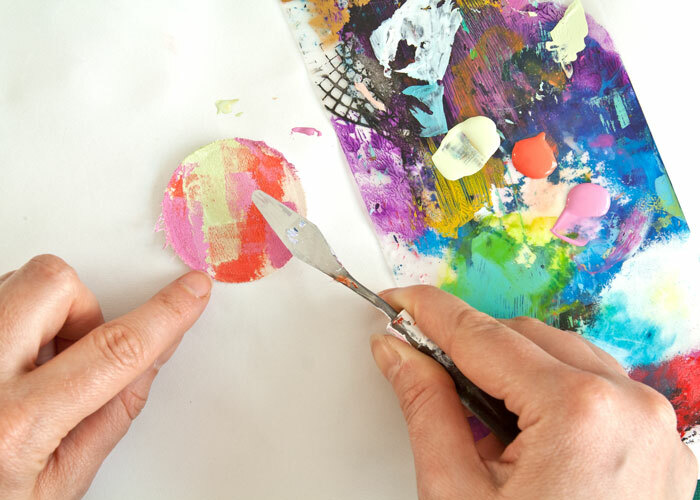 Step Two: Colour the calico circle with Teresa Green, Coral and Bubble Gum PaperArtsy Fresco Finish paints and a palette knife. On the negative cut-out piece of stiffened calico add a strip of the Teresa Green with a strip of Coral on either side of it.Then paint the rest of this piece with the Teresa Green paint. Let the paint dry. Step Three: Darken some Blueberry PaperArtsy Fresco Finish paint with a very, very small amount of Little Black Dress PaperArtsy Fresco Finish paint. Spread this paint thinly on plastic and dip the stamp into it, mask any bits you don't want stamped with Washi Tape and stamp the image on the coloured fabric. Work quickly once the paint is on the stamp as you don't want it to dry. Once you have finished wash the stamp with water straight away. 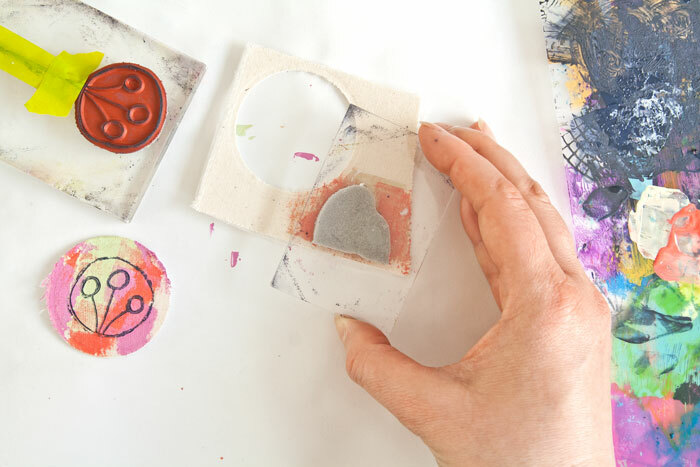 I like stamping with paint like this as I think it adds more texture to the stamping then using a piece of foam to add the paint to the stamp, but there is nothing to stop you using the foam if you prefer. Stamp one of the large circle 'flowers' stamps on the painted calico circle and the hedgehogs stamp on the Teresa Green / Coral coloured strips on the negative cut-out piece. 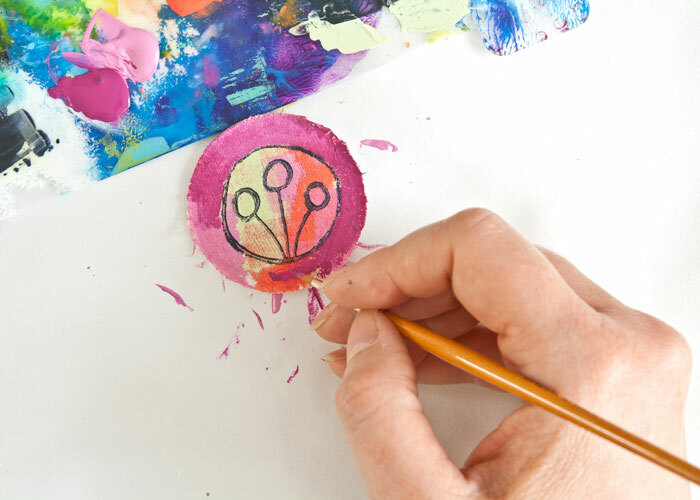 Step Four: Now paint around the edge of circle flower with Bougainvillea PaperArtsy Fresco Finish paint using a brush. 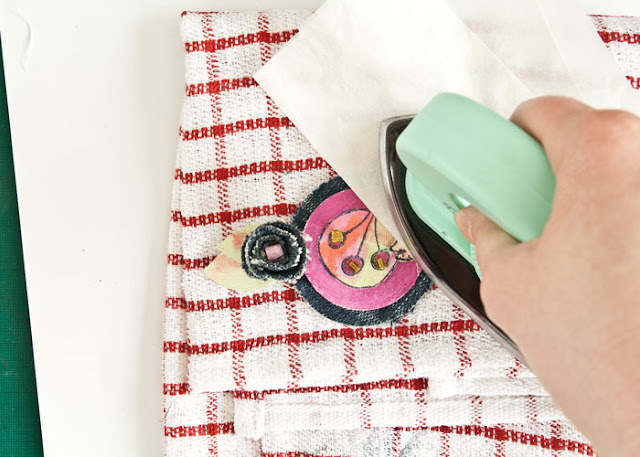 Once the paint is dry stitch a bead in the centre of each of the 'flower's' inner circles and stick the piece to one of the denim circles from Step One using the iron. Cut out the two hedgehogs with scissors and iron these to the painted circle to activate the Bondaweb on the back and glue them in place. Cut the second denim circle into a spiral and roll it into a rose shape then stitch to hold it together and also stitch a large bead in the centre. Cut the last piece of the negative cut-out into two leaves and stitch them to the bottom of the rose. Step Five: Add Bondaweb to both sides of a piece of craft interface then iron a piece of denim onto one side of the interface. 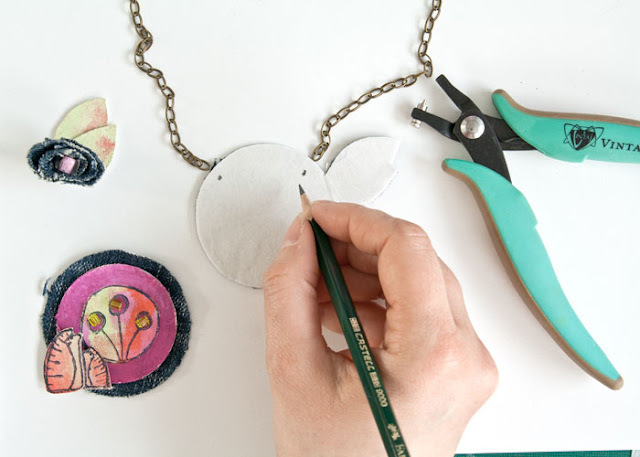 Arrange the circle and rose in place on spare paper and draw around the shape, this will be the shape of the finished pendent. Cut this out and use it as a template to cut out the shape from the craft interface / denim combo making sure that the denim side is the back of the shape. Place the shape onto a flat surface and use a pencil to draw in where you want the holes for the jump rings and punch these with a small hole punch like the Vintaj hole punch pliers. Add the jump rings to the holes before moving on to the next step. Step Six: Place the circle and the rose onto the Bondaweb side of the shape from Step Five and carefully iron all the pieces in place. You will need to work around the beads and on uneven surfaces. 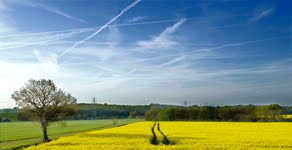 Make sure that the tops of the jump rings remain accessible as you work. You may have to be a bit patient to get a good fix with the Bondaweb as the heat needs to travel through several surfaces. There you have it a finished fabric pendant, now all you need to do is to add the chain to the finish the necklace and wear it. 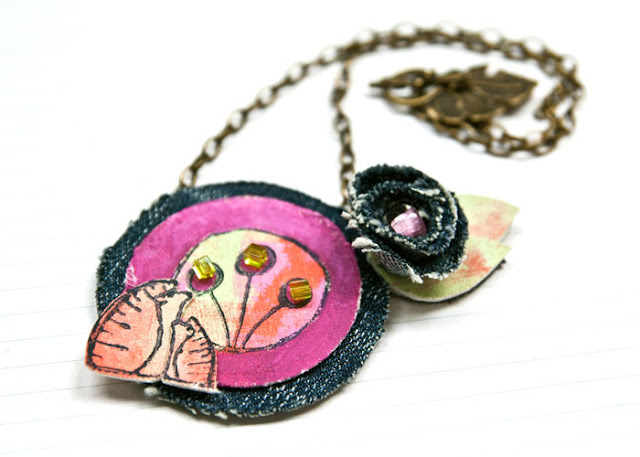 I do love using denim in my wearable art and I love stamping on calico too! 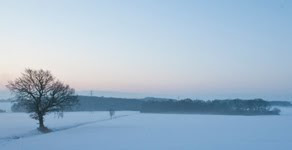 Hope you have fun with this and give it a go yourself. Do give me a shout if you do as I would love to see your make. As always you are welcome to get in touch with me with questions or to show me what you have made via any of the links listed below. This is just wonderful, Kim, I love all the details such as how you spread the paint with the palette knife. I think the use of denim really makes it and I must try this (must have some jeans I'm too fat for!). A perfect piece of wearable art with those delightful hedgies! 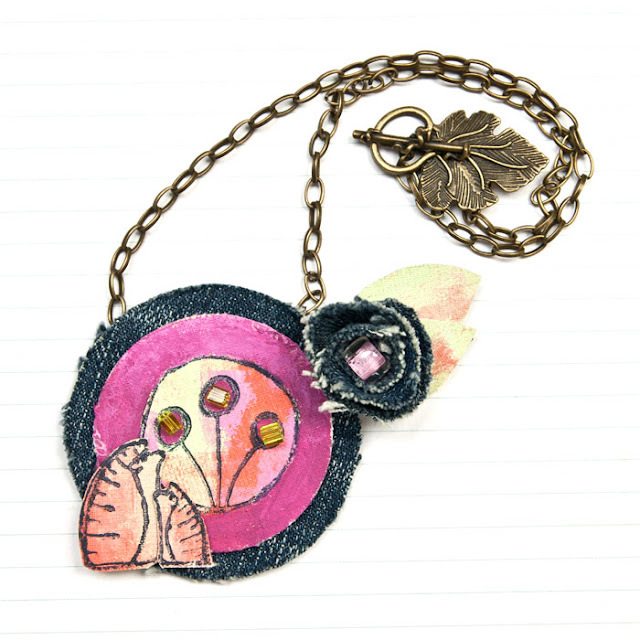 Lovely fun piece of wearable art Kim. Your hedges are the perfect size for this sort of thingredients.